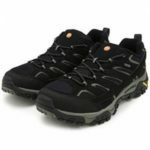 Are Karrimor Bodmin 5 Ladies Weathertite Walking Boots More For Dog Walkers? The Karrimor Bodmin Low 5 Ladies Weathertite Walking Boots are a good looking product that don’t look like some of the tougher, heavy-duty walking boots around. This may put some walkers off. 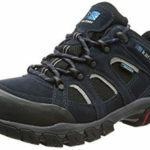 But, there are those that will like the sound of a lighter, comfortable shoe that they can put to use on a daily basis. This lightweight, low-profile boots should have great potential, but what do wearers actually think? A good grip for those hiking on rougher ground. Many of the positive comments for these Karrimor Bodmin Low 5 Ladies Walking Boots actually come from dog walkers, rather than hikers. There is the sense that this shoe does just enough to offer support, comfort, grip and waterproofing for general use. But, it might not have the specification for longer treks in the rain. The weatherproofing on this Karrimor walking boots comes from an “exclusive” lining that is both breathable and waterproof. Others say that it is easy to top up the waterproof coating each month to prevent bad leaks. 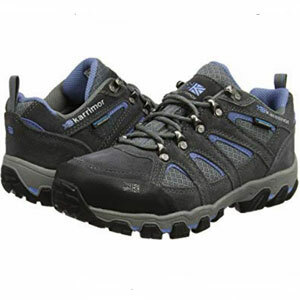 There are some buyers that use these walking boots for long hikes with few issues. There are enough comfort features in the materials and sole to provide support along these longer distances. This includes the leather-feel lining around the collar and the cushioning of the phylon midsole. These more adventurous walkers also have few complaints about the grip. Again, this isn’t the chunky outer sole and tough grip or more high-end walking shoes. But, there is enough grip here for rough terrain on mountain walks. The biggest issue with these Karrimor Low-Rise Walking Boots is durability. There are some buyers that have commented on the lack of glue used in these hiking boots or, more to the point, the amount they are using to hold the soles together. The insoles have come loose far too easily. This is also far too frequent a comment to be a fluke. Others have had problems with the outer sole coming free and issues with the laces. The laces aren’t such a problem because they are easy to replace. The soles should last a little longer than one season. Then there are the usual comments about the fit of the shoes. Some feel that they run a little large and can result in a couple of blisters. 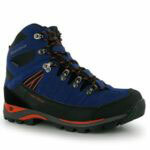 What does this all mean for a final recommendation on this Karrimor Bodmin V Women’s Walking Boot? Calling an insole removeable is one thing, and there are buyers pleased that they could replace the insoles here with ease. But, the components of this hiking shoe could be a little more secure to improve the longevity. This durability is the main problem. Otherwise, there are enough people happy to wear these shoes on walks. There are even some that have multiple pairs because they are so content with the fit, comfort and reliability of the shoe. There is room for improvement here. 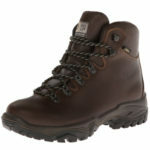 Still, these Karrimor ladies walking boots will be a great option for those that don’t need anything too heavy-duty. 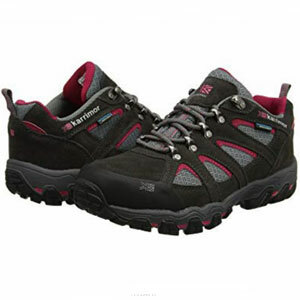 Find more reviews about the Karrimor Bodmin 5 Ladies Walking Boots on Amazon here.